NHRA – CELEBRATE INDEPENDENCE DAY WITH US! NHRA National race has been moved permanently to July 4th week, and in 2013, it will be July 4-7. Many of our guests will have Thursday, July 3 and Friday, July 4 as vacation days. Plan your summer around the 7th Annual Summit Racing Equipment NHRA Nationals! Celebrate speed, horsepower and our nation’s birthday July 4 – 7, 2013! Top Fuel dragsters and Funny Cars, you’ll see jet cars and our signature fireworks show celebrating our nation’s 237th birthday. And to help make this a more affordable family vacation, Friday reserved seats for kids 12-under are FREE with paid adult reserved tickets! Watson graphics now grace the hood of Holbrook’s ’13 Cobra Jet. 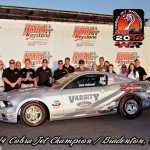 Now Watson-sponsored, the Varsity Ford/Watson Cobra Jet made its debut at the NHRA Lucas Oil Drag Racing Series at Summit Racing Equipment Motorsports Park in Norwalk, Ohio, sporting some fresh new graphics. Again, the racing Mustang took home the cash and won as the quickest and fastest car to grace the grounds. Next up is Old Bridge Township Raceway in Englishtown, New Jersey. More records are likely to be beat.